Stennis Space Center is a unique federal and commercial city that is home to more than 40 federal, state, academic and private organizations and numerous technology-based companies. For more than five decades, Stennis has served as America’s largest rocket engine test complex. Located in Hancock County, Mississippi on the Louisiana border, the workforce of 5,000 civil servants, contractors, scientists, and engineers provides a significant source of employment and income in the two state region. Michoud Assembly Facility in New Orleans is a world-class manufacturing facility providing vital support to NASA exploration and discovery missions. 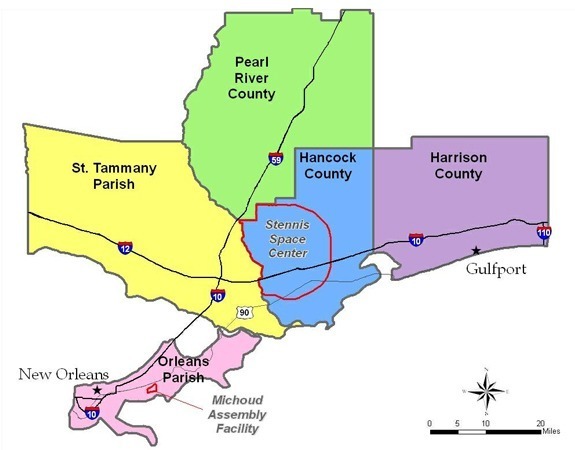 Michoud is NASA-owned and managed for the agency by the Marshall Space Flight Center. Michoud’s capabilities include the manufacture and assembly of critical hardware components for exploration vehicles under development at Marshall and other NASA centers. The Naval Meteorology and Oceanography Command is headquartered at Stennis Space Center. The command administers nearly 1,000 personnel at Stennis, comprising the largest concentration of oceanographers in the world. The partner communities in Mississippi and Louisiana surrounding Stennis offer abundant job opportunities. Information on jobs with agencies or companies located at Stennis can be found by their home organization websites (for a complete list, click here). For the Partners for Stennis Space Center Job Bank, click here. Below, you’ll find a number of links to help in your search for area opportunities.